JERUSALEM (CNN) -- Two years after he was assassinated at a peace rally, former Israeli Prime Minister Yitzhak Rabin continues to divide Israel in death, even as he sometimes did in life. There are many in Israel who still mourn Rabin's death, and the circumstances surrounding his death continue to provoke charges and counter-charges, revelations and doubts. The most recent occurred Friday when Karmi Gillon, the former head of Shin Bet, confirmed that a right-wing militant with ties to Yigal Amir, Rabin's assassin, had been an informant for the secret service. Gillon, who resigned after Shin Bet's failure to protect Rabin, said that Avishai Raviv had worked for "many years" for the security agency as a mole in the ultranationalist camp. Gillon's admission comes two days after Attorney-General Elyakim Rubinstein said that he might bring charges against Raviv on suspicion that he had failed to stop Amir, an ultra-religious Jew, from carrying out the assassination. Raviv befriended Amir before the assassination, and his identity and his role as a Shin Bet informant have been an open secret in Israel. But Gillon's comments, in an interview with Channel One television, officially confirmed his link to the secret service for the first time. Raviv's presence at the peace rally where Rabin was gunned down in Tel Aviv, his widely known role as a Shin Bet plant and his friendship with Amir have prompted charges that Rabin's death was the result of a far-right plot. 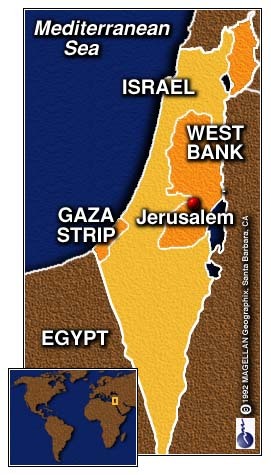 A plot, some say, that the government was involved in. Prime Minister Benjamin Netanyahu himself has been under fire from those who claim he led a vicious right-wing campaign against Rabin. 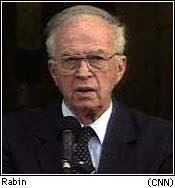 And they note that at Netanyahu's anti-peace rallies, radical protesters often portrayed Rabin as wearing a Nazi uniform. Netanyahu's supporters counter that there was a plot, all right, and it involved Raviv and Shin Bet. They claim Raviv deliberately goaded Amir -- who was sentenced to life in prison -- and other right-wing radicals in their hatred of Rabin. Two senior ministers in Israel's right-wing government to demand investigations of his actions. But Gillon defended Raviv, saying "(Amir) did not let (Raviv) in on his plans -- I wish he had." Gillon was critical of what he called attempts to ignore "the continuous campaign of incitement and rebellion" waged against Rabin over his peace policies and the attempts to "pin everything" on Raviv. He and other Shin Bet officials have called the right-wing charges of a Shin Bet plot "blood libel," and he went to great lengths to explain why Shin Bet employed Raviv. "You and I cannot be agents among the extreme right -- we simply wouldn't be accepted there," Gillon said during the television interview. "That's why you have to recruit people from among them ... and if they don't act like those around them, the agents will not glean any intelligence information," Gillon said. Nevertheless, he admitted that having Raviv as an operative had been "problematic." Raviv has been in hiding since the assassination.